Aluminum's unique physical properties include good specific strength, high electrical and thermal conductivity, nonmagnetic behavior and resistance to oxidation and corrosion. Harrison Electropolishing performs mechanical polishing operations of aluminum for a multitude of applications. To achieve a specific surface finish or highly lustrous finish (i.e. light or heat reflector), aluminum should be mechanically polished. At Harrison Electropolishing we have the experience and expertise to meet the most stringent requirements of today's industries. Our unique process combines precision mechanical polishing techniques, the latest precision polishing equipment, several proprietary components and over 30 years of experience to deliver the quality and service you require. 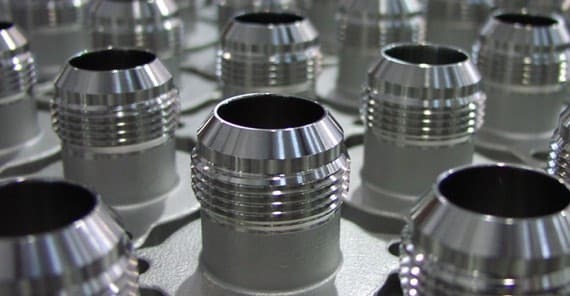 We have a broad range of capabilities; from basic deburring of a cast, forged or fabricated parts, to ultra fine finishing for high purity applications. Harrison Electropolishing can mechanically polish aluminum and certify a finish as low as 4 Ra micro-inch.